Yesterday we looked at job growth across the U.S. based on metro size, including rural areas. Today we’ll take a similar look at growth here in Oregon. Overall we know our economy is more volatile than the typical state. We fall further in recession but grow faster in expansion. Given the economy spends many more years in expansion than recession we tend to come out ahead over the entire business cycle. The two main reasons for this volatility are our state’s industrial structure and our migration flows. The Great Recession is shaping up to be no different, even if it was clearly much more severe overall. Each of our areas here in Oregon — from our largest metro in Portland to our secondary metros to our rural areas — saw larger job losses than their counterparts across the country. However now that we’re coming up on the expansions’ 8th birthday, Oregon is starting to pull ahead across the board. Relative job growth patterns here in Oregon are both similar to the U.S. overall and different. We’re similar when it comes to the largest metropolitan areas. Portland, like the nation’s other big metros, popped up first in recovery. For the last 6 years Portland has been adding jobs at a 2-3% annual rate, which outpaces the typical large metro by about 0.5 – 1 percentage points. Where Oregon differs is in the growth of our secondary metros and rural areas. 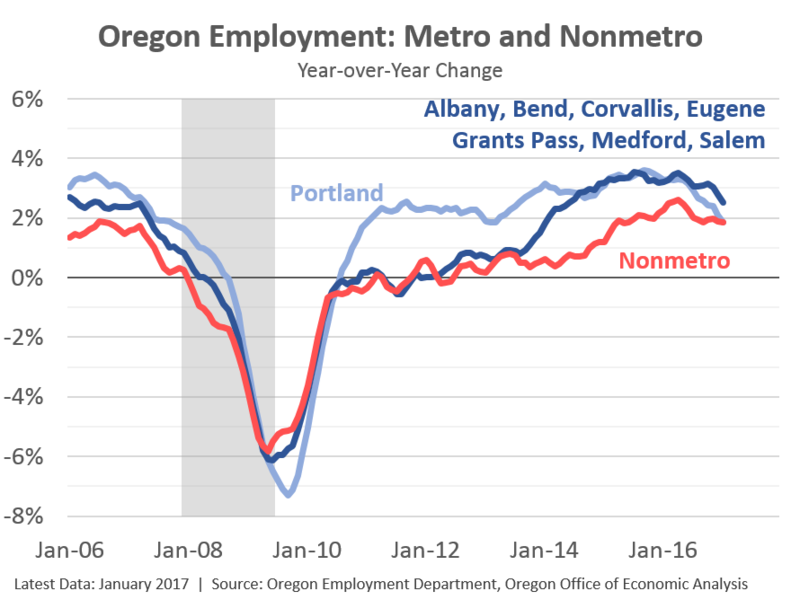 While it took a few additional years for Oregon’s secondary metros to see the expansion, they have really come online in the past 3 years. 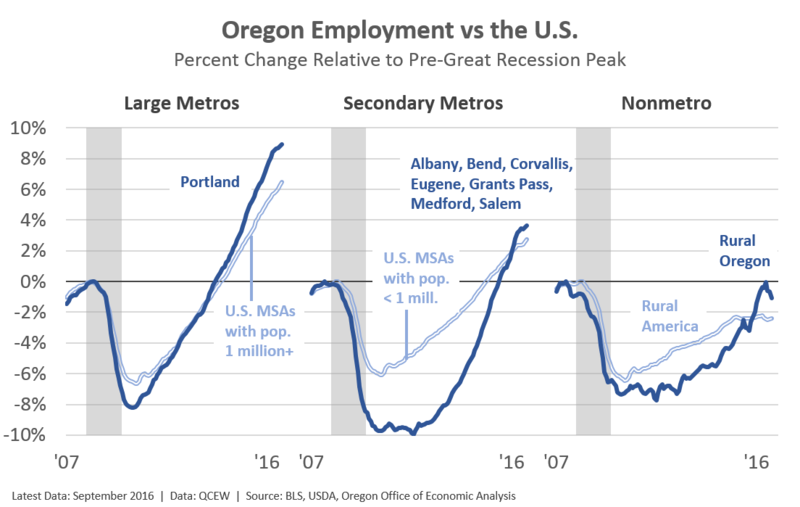 They’re now adding jobs at a faster rate than Portland is, and considerably faster than their national counterparts — 3-4% here in Oregon vs 1-2% nationwide in recent years. Much of this has to due with the nature of the business cycle. Bend and Medford were among the absolute hardest hit housing bust metros in the entire country. It took considerable amount of time to recover and reorient following the busts they experienced. But the strong growth isn’t limited to Bend and Medford either. In recent years Albany and Salem are growing faster than they have in decades and Eugene is seeing above average gains too. Even as rural Oregon faces challenges — see our report — job growth in recent years is probably the most encouraging sign. This is particularly true in a relative sense compared to the rest of rural America. It took even longer for growth to return to many rural communities, however all regions of the state are now adding jobs. In fact, rural Oregon is adding jobs at a roughly 2% pace for nearly two years now. That growth, as we pointed out at our forecast release, is faster than the U.S. average overall. Now, most rural counties have yet to fully regain all of their lost jobs. As of the recently revised and released data, the typical rural county in Oregon today has recovered a bit more than 70% of their recessionary lost jobs. That said they are making progress and seeing stronger growth than the majority of their national counterparts. While the longer-run trends have been lackluster, the short-term trends are very good news. Data Note: this last graph shows CES employment data, whereas all of the previous was QCEW. For rural Oregon, CES employment pegs it at -2% below pre-Great Recession levels while QCEW pegs it at -1%. Given they come from different data sources, the underlying data do differ but are telling the same general story.